Originally published by DE Indymedia. Edited machine translation by Enough is Enough. This morning at 6h it was time again. 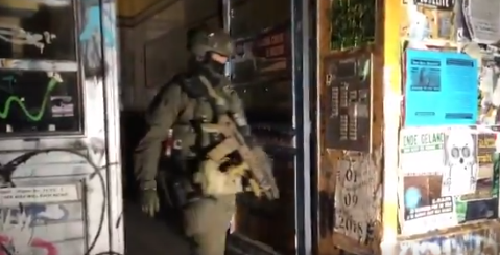 SEK (German anti-terror squad, EIE) with laser aiming devices (aiming at people who behind the windows) in colorful colors leaping through the courtyards, helicopters woke up the inhabitants of the whole neighborhood and a grunt goes through the neighboring community … raid! After a few months of silence, it was time again: Blue light party Rigaer Straße. This time we were not the only ones affected. At the same time more than 500 cops stormed several apartments in Berlin. We don’t know exactly what the excuse was and therefore we don’t want to speculate and nobody else should do this! The facts are that some, but not all, apartments have been searched. According to the search warrant they were searching for clothes, shoes, cell phones, recordings, calendars and address books. According to the seizure protocol, none of our belongings have been confiscated. In fact, a box of unknown content was carried out of our house. Our lawyer was denied access at first … as always. Utter mockery is the statement, “Nothing has been damaged,” written down on the seizure protocol, and the long, still-lasting, waiting for our doors to be repaired. These have been opened amazingly fast and without massive destruction. Of course they are damaged anyway. Since the ordered locksmith seemed to refuse to do the dirty work for the cops, they had to do it themselves. Then district officials, together with construction workers and M. Bernau tried to check our fire safety. Markus B. has often spent his time as a lawyer for the alleged owner of Rigaer Str. 94. Even the court doubts this, however. Of course, as the cops try to score a propaganda victory with this operation, it is not surprising that the press was already there before the operation started. Markus Bernau was also noticed by derogatory remarks and verbal derailments against our roommate. This has probably to be seen as an attempt to rise from the absolute insignificance of an incompetent traffic lawyer at least to a general clown. His actions may seem ridiculous and he is incapable, yet we should not forget with what commitment he tries to work his way up on our list of enemies. We want to do this favor to him. Markus intended to go for it again. Together with construction workers, who were already involved in the eviction attempts against parts of the (Rigaer, EIE) 94 in 2016, which were heroically repelled by our many supporters, he tried to take advantage of the hour and pinched a few doors. From there he really went to far and we had to throw him out. Now Markus had considered for about an hour what to do now and started a second attempt. After he and his gang moaned for another hour outside our door and clogged the street, they were sent away by our lawyer. What remained was the announcement to come back and remove our doors. Well, we will see! We do not care if they are called Markus Bernau or 99100564 or Schwein Henning! They should all watch their back twice soon! We do not care if it’s Rigaer Straße, Grünberger, Reichenberger Straße or Maybachufer! We are far from used up! We are all standing together! Repel attacks from cops and investors! #Berlin: They‘re coming closer! – International call to support #Rigaer94 – Enough is Enough!